This past Tuesday, Mac Demarco passed through the Capitol for another round since November 2012 to play some rock & roll songs at the DC9 nightclub. Luckily, I found time to see the comical Canadian play, despite being in the midst of midterms. And I am glad I did. 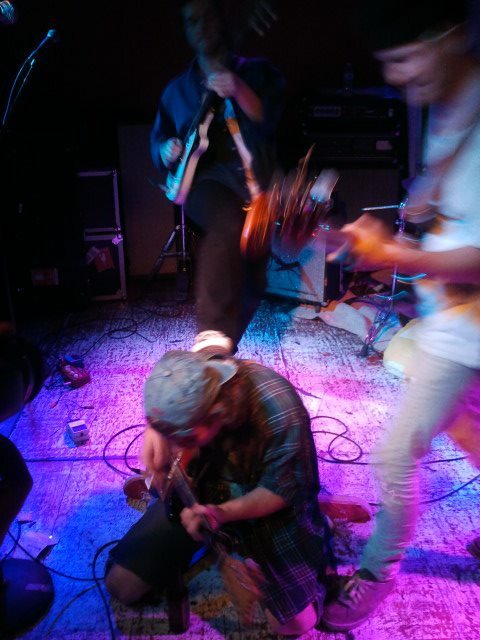 Mac Demarco’s first time in D.C. apparently hosted only twenty-or-so patrons, but since the release of his album 2, the man blew up amongst the indie rock scene. Therefore, DC9 found itself with a full venue and a shortage of tickets. Thank you, Mac! Opening for Mac were two acts hailing from different genres: First was Calvin Love, and second was Naomi Punk. Calvin Love took the tiny stage with his seemingly newly acquired road band that consisted of a bassist and drummer. An obvious solo-project, Calvin admitted towards the end of his set that he had taught his bassist the tabs to his songs on the way down from their prior show in Philadelphia, but this was no matter. The band put on a dance-y, jangle-pop set with pre-recorded beats and glamorous rhythms to do the “indie-shuffle” to. The dude was fun. Really fun. And to top it off, Calvin closed his set with a cover of one of my favorite Devo songs: “Gut Feeling/Slap Your Mammy.” This dude definitely has some potential, so pick up some of his tracks while he’s still under the radar. Following Calvin Love was a band from Washington State known as Naomi Punk. This trio’s set was ear-bleeding to say the least, but if that’s what you’re into, then that’s cool. Label mates of Mac Demarco and DIIV on Captured Tracks, Naomi Punk consists of two guitarists and a drummer that seem to fulfill the likes of a Washington-based band: grungy, garage-y, loud, and free-flowing. Their set shook DC9 with power chords and simple, rough drumming that drowned out their lyrics, and at times was reminiscent of Nirvana. These guys put on a good set, but they certainly weren’t under the same umbrella as Mac Demarco or Calvin Love in terms of genre. Nonetheless, Naomi Punk will leave your ears ringing for a day or two. Finally, the main act of the night, Mac Demarco, set up and took the stage with his road band featuring a lead guitarist, a bassist, and a drummer. They expertly followed the lead of Mac’s vocals and rhythm guitar. Mac’s set was slicked in a surprising amount jangle and reverb despite not using any pedals himself. He was using self-made guitar, with a makeshift pick guard and tuners, which was directly connected to a Fender Deluxe Reverb amp. The band opened with a thoroughly performed rendition of “I’m a Man.” The song was raw, sleazy, and everything that a Mac Demarco song is. There was a funky bass line, a filling guitar rhythm, and a catchy lead, along with a chorus backed with backup-vocals. Throughout his set, Mac and his band filled the night with humorous antics and stupidity such as a brief cover of R. Kelly’s “Ignition (Remix),” prior to performing “Baby’s Wearing Blue Jeans.” They definitely kept the crowd laughing, and even more so, entertained for the entire night. Mac is much more rock & roll live; faster paced, and more energetic than on record– in the best way possible. During “The Stars Keep on Calling my Name,” the band weaved into two different covers before concluding the song. His knowledge for entertainment seemed natural, as he sacrificed no audience captivity albeit his unserious recitations of his lyrics. In conclusions to the show, Mac asked for and received permission from the stage master to crowd surf, the crowd obliged, and I got a hand in it before he was delivered back to the stage. I tell you, this man has a knack for putting on a good time, so if you ever get the chance to go to a Mac Demarco show, please do so. You will not regret it. Next PostNext I Can't Get Down with "Bow Down"